In the fall, the ACSC tournament was an amazing learning experience for many of the boys. Positions were filled with inexperience all over the formation, but the boys fought to stay in the tournament and came out with a 5th place finish amid a very strong field. Along the way, they defeated Dalat and ICS-HK. The 13-14 season would be back and forth for the guys squad. 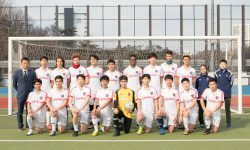 With dominating wins against Daegu, Osan and newcomers Humphreys, the guys couldn’t quite top the field, tying TCIS and losing to SFS and SAHS twice each. The KAIAC tournament was a breakthrough. While they lost to SAHS in the semifinals, they were able to defeated TCIS to take third place on the TCIS home field. Senior Shin Ikeda led the team in many ways, creating the attack from the midfield and putting pressure on the defense of opponents.